I always enjoy highlighting BBC (Blandin Broadband Communities) projects. It’s fun to hear how folks are using broadband. Some porjects are entirely unique and some really catch fire. 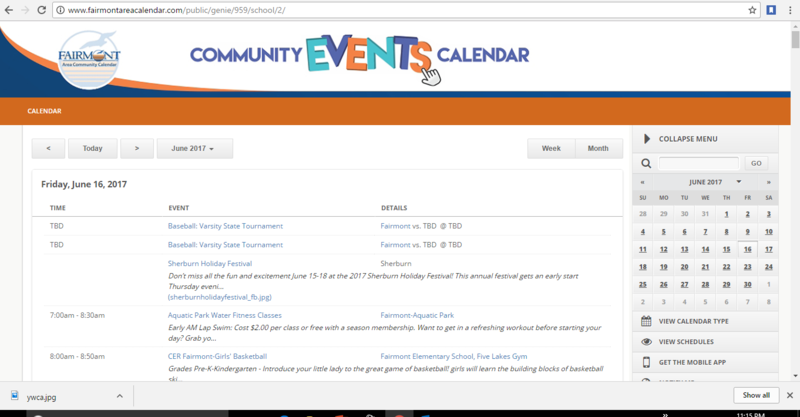 Knowing that, I was intersted in hear that Fairmount was really happy with their online community calendar. Community Calendars are hard. They require constant updating. In theory, it’s great to get folks to add in their own events. In practice that great idea doesn’t always catch on. Fairmont’s calendar has caught on. I think they had two secret ingredients: they worked hard to get people engaged and invested AND they found a calendar system that works for them. It is gaining the reputation of being a one-stop online presence for events here. Previously, the chamber was responsible for attempting to keep track of events, happenings and entertainment throughout Martin County, so our strength comes from working with multiple government entities and other organizations. In addition, we utilized billboards, newspaper, radio, CER catalog, chamber and city social media and publications and email campaigns. The calendar behind the Fairmont project is the Community Calendar version of our popular Activity Scheduler. Activity Scheduler is a school calendar and Athletics Management System used by over 5,000 schools for the last 16 years. 1) Most of the organizations in any town have web sites that have calendar events on them. But it forces the community to go to so many sites to get a real picture of what’s happening. 3) Even if you could afford to hire someone to aggregate all the calendar data in a community and repost it to one calendar, things still slip through the cracks. Date/time/location changes are mostly missed, etc. 4) Nobody wants to use a shared calendar as their organization’s calendar. They want a calendar that is 100% theirs. Solution: So, with the rSchoolToday Community Calendar, the goal is no one has to rekey anything! Every organization in your community that wants to participate (city/county government, chamber, CVB, churches, youth groups, Park/Rec, schools, service organizations, etc) can have their own low-cost rSchool calendar, and that becomes their Web site calendar. It is simple to use, powerful, 100% editable, includes a free mobile app, and can be branded to match each organization. When data is entered into each organization’s calendar to show on their web site, those events automatically also write to the community calendar. And, the schools are likely already using our calendar so their data will already be in the Community Calendar. But…”I have spent so much creating a special look to the calendar events on our CVB page – I don’t want to lose that.” No worries. rSchool can feed calendar data into any other calendar that can accept a data feed. So, by using the rSchool calendar to enter the data, you have the best of both worlds. Advertising? You can choose for NO ads on the calendars. Or, you can use our Local Ad model and control the ads on your calendar. you can feature all local businesses and charge whatever you want each month or year. This can make the Community Calendar a powerful revenue-generator for the community as well. Buying Tickets online for events? If you have a ticket program, you can link any ticket site to that event in the calendar to make things easy. Don’t have a ticket app? We can provide one. Social Media? Your community can promote any calendar event to their social media sites. Can I be selfish? “I only care about restaurants, live music, art galleries and soccer.” No prob. Select the things you care about, generate a personal calendar, and push it to your smart phone or tablet. Now any changes to those activities auto-update your smart device. But I tend to forget….No worries, sign up for reminders and change notices for the activities you care about and receive email or text messages automatically. This entry was posted in BCBP, Broadband Applications, economic development, education, Government, MN by Ann Treacy. Bookmark the permalink.